Despite heavy rain, a group of about 40 protestors gathered near the Parliament on June 28 in the latest demonstration over the fate of ancient gardens. The Dalma Gardens cover 530 hectares of land near the Tsitsernakaberd Genocide Memorial in Yerevan and have a history stretching back 3,000 years. It is now considered a cultural-historical monument where, since ancient times, grapes have been grown and wine produced. More than 1,000 farmers currently work the land, many of them for decades. 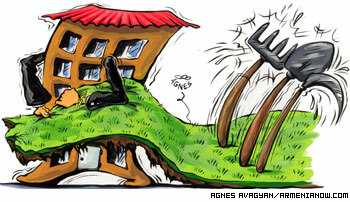 However, Yerevan Municipality’s urban development program now threatens to engulf Dalma Gardens. The gardeners claim that an official decision has already been taken to uproot fruit trees and vines in order to build roads and to sell the territory to numerous factories. 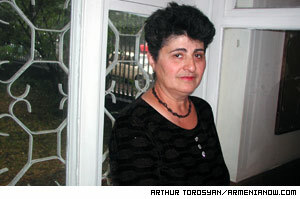 Gayane Hakobyan is a mother of five small children and survives by working her garden. She says she has a lease for at least 10 more years but that the municipality does everything to get people off the land. Hakob Sanasaryan, the president of the Union of Greens, which campaigns for the environment, says that Dalma Gardens demonstrates the human capacity to turn semi-desert land into rich and fertile gardens through persistent work. “The issue is very serious. If the gardens are destroyed the city will lose its lungs,” he says. Sanasaryan says everything has become complicated since the status of Dalma Gardens changed to a development zone. Further determination of its future is carried out in secret by the city and national authorities and accompanied by disorienting propaganda. For instance, the Mayor of Yerevan and the city’s chief architect insist that the city planning project will give an opportunity to save and maintain the Dalma gardens, but Sanasaryan says this amounts to a death certificate. “Putting Dalma Gardens under construction to fulfill the budget is very much like a villager who kills his only cow just to eat khorovats for one day,” he says. Ashot Sahakyan, the head of Territorial Policy Analysis Department at the National Assembly, assigned to investigate the issue, says that after the gardeners’ request they are studying the matter hard. “If there’s so much noise around the issue then something’s wrong there. We shall try to find a solution to the problem as soon as possible,” says Sahakyan. 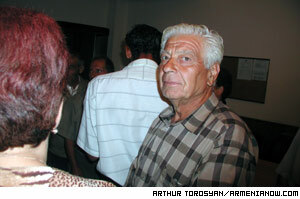 Gardener Ruben Rostamyan is pessimistic. He says: “We went to the President’s residence and we’ve contacted other officials. However everything seems pointless. Everyone promises that everything will be fine, but promises are just words and the situation gets worse.